Opioids: Are You Part of the Problem? 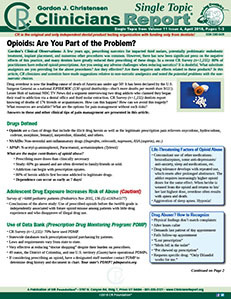 Answers to important questions and other clinical tips of pain management are presented. This is one article from the April 2018 issue of Clinicians Report. • Are You at Risk for Substance Abuse? This is one article from the April 2018 issue of Clinicians Report. For the entire issue, please go to April 2018.